Today, Freedom for All Americans is proud to stand with the Equality Ohio Education Fund, the Movement Advancement Project, and the National Center for Transgender Equality – in addition to other state and national partners – for the launch of a new national television ad showcasing the discrimination that transgender Americans face each day. 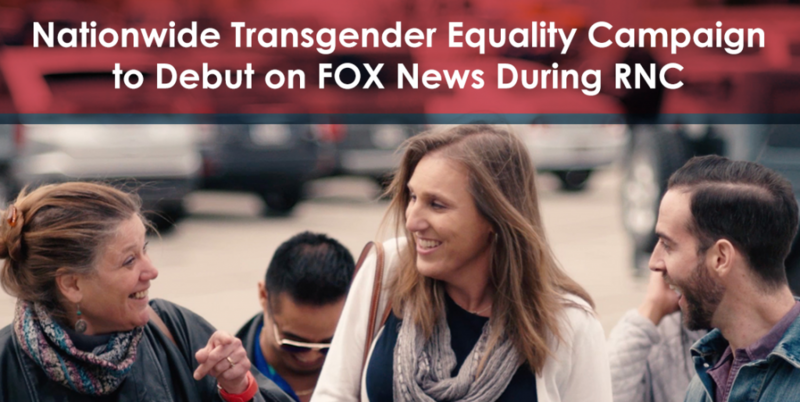 The ad is the centerpiece of a national coalition of LGBT groups, Fairness USA, dedicated to educating more Americans about the challenges and discrimination transgender people face each day. Learn more about Fairness USA here. The ad features a transgender woman who experiences discrimination while trying to use the restroom – a public accommodation that all Americans use every day. The 60-second spot will debut on July 21, 2016 on FOX News Channel during the Republican National Convention in Cleveland, Ohio. Check out the Fairness USA website launched in conjunction with the campaign. The ad, which will air nationwide again on MSNBC during the Democratic National Convention in Philadelphia one week later, will also highlight the lack of state and federal nondiscrimination protections for transgender people — a topic many Americans who are not transgender may be unfamiliar with. The ad’s timing and placement coincide with a shift that is occurring among the public and policymakers nationwide, as well as in the ranks of the Republican party, where greater numbers of conservatives than ever before are expressing support for the transgender community. Presumptive presidential nominee Donald Trump has offered varying opinions on the issue of transgender rights, but stated that North Carolina’s HB2 has caused “a lot of problems” and that transgender people should “use the bathroom they feel is appropriate.” Texas Sen. Ted Cruz’s presidential campaign relied in part on glaringly anti-transgender ads, only to see his electoral chances plummet shortly afterwards. Governor John Kasich of Ohio explicitly condemned the law and legislation like it on multiple occasions. Other legislative leaders – including Rep. Ileana Ros-Lehtinen of Florida and Sen. Rob Portman of Ohio, both of whom have children who are transgender or gay – have also offered full-hearted support for protecting LGBT people from discrimination. Around the country, GOP Governors in particular are proving that LGBT non-discrimination is a bipartisan issue. On Friday Republican Governor Charlie Baker in Massachusetts signed a bill that will protect transgender people from discrimination in public places, including restrooms. Earlier this year, Governor Nathan Deal of Georgia vetoed a bill that would have explicitly legalized discrimination against LGBT people, and Governor Dennis Daugaard of South Dakota vetoed a bill that singled out transgender children for discrimination. If you are one of millions of Americans who are committed to standing up for transgender Americans’ ability to live free from discrimination, we invite you to join us and our partners in signing the Fairness USA pledge. You can also chip to help keep this ad on the air. Just click here to donate.